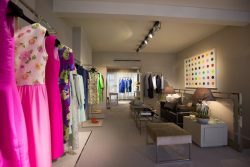 In a rare interview, we talk to Stewart Parvin, the London-based fashion designer who has become one of Britain’s most famous courtiers. 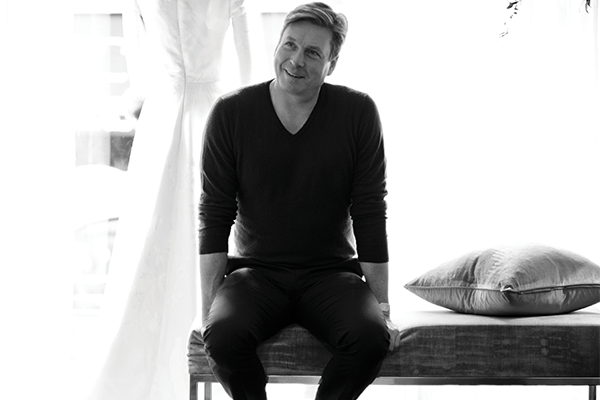 A holder of a prestigious Royal Warrant since 2007, he has designed dresses for international royalty as well as the ballerina, Darcey Bussell. Over the past 25 years, Stewart has designed more than 6,000 dresses during his glittering career. From his Belgravia boutique, he discusses his inspirations, the dress he is most proud of and fashion trends for Autumn 2018. A: Very classic, very elegant and very understated. It does not scream – it whispers. My clients will know if they are seen in one of my dresses. Q: Who are your fashion legends? A: Classic Givenchy, Valentino and Oscar de la Renta. Q: Can you name a woman and a man with great style? A: It sounds boring, but it is true: Audrey Hepburn. And there is a local man on Motcomb Street, who is very stylish. He has a selection of coats, T-shirts and handmade shoes. Everything he possesses is stylish. It’s the way he puts everything together. He is so chic. 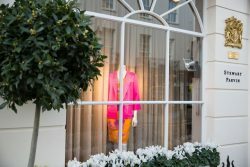 Q: How long have you had a boutique on Motcomb Street, Belgravia? A: I have worked on Motcomb Street for 23 years and live near Marble Arch. A: At the moment, I am obsessed with double-face wool, and baby alpaca. I will be making the most gorgeous coats for autumn. Q: Paris, Milan or London Fashion Week? Which is your favourite? A: Paris – it’s much more me. Q: How many dresses have you designed over the years? A: I used to design two collections every six weeks with at least 120 dresses. But over the past 25 years, I must have designed around 6,000 dresses. Q: Any fashion trends that you think should be left in the past? A: No – give it six months and the trend will come around again. Never say never. Q: You have designed dressed some of the world’s most famous people? Who else would you like to design a dress for? A: Just at the moment, I am watching Margot Robbie as Tonya Harding. I would like to design a dress for her. Q: Any fashion tips for anyone who wants to look younger? A: Just because you can – it does not mean it fits. Everything we do is about the fit and subtle alterations. By changing the size of the shoulder, it can make you look lbs lighter. Q: What dress are you most proud of? A: The next one [dress] I design. Q: Accessorising? What would you suggest? A: Be bold. Don’t be stingy with your accessories. Buy a good handbag and a good necklace. Q: What are your five fashion tips for autumn? A: Autumn is going to be about understated luxury. Don’t stint on clothes for Waitrose, you wear them the most often. Navy blue is never out of fashion. Cashmere is always the best. Don’t be afraid to dress up, everyone else will be jealous! Q: Do you ever look for models to wear your clothes or for movie premieres? A: We don’t do it very often, but do occasionally. Everything we do is about the fit. You are pretty much guaranteed to be photographed in one of our dresses. Darcey Bussell wore one of our beautiful pink dresses with a leather jacket at the Spectre Premiere. Q: What is your favourite thing in your wardrobe? A: Navy blue double-face cashmere coat. Q: What has been the best fashion after-party you have attended? A: The best was a Giorgio Armani party in New York at the Guggenheim Museum. There was dancing, food and it was the time of the Fugees as well as Grace Jones. Literally everybody was there. Q: When does your summer sale end? A: Our summer sale finishes at the beginning of August. Then in September, we will be moving to 9 Motcomb Street, where we will have a whole town house. Q: On the practical side, many people suffer from moths at home. What do you recommend? A: If moths are in your clothes, then they are more likely to be in your dried goods and cereal in the kitchen. Clean everything, start again. Put your clothes in the freezer, which will get rid of the moths and smells. You can put cashmere in the freezer for three months, so it stops pilling. Q: And how about stains on clothes? Any advice? A: Don’t rub it in, take your clothes straight to the cleaners. Q: Which famous people have you designed dresses for? A: I have designed a lot for international royalty. Q: Any last pieces of fashion advice? A: If you save a piece of clothing, it will go out of fashion. Never keep anything for best. Best never comes. Best is every day. Our thanks to Stewart Parvin for his help with this interview.